Fifth Sense | Come Due Maiali / "Like Two Pigs"
I am officially cookied- and cupcaked-out! Don’t get me wrong: I have a big appreciation for sweets, especially those made with sea salt caramel and custard. It just looks as if most chefs and their loved ones went on a molten cake, muffin and mousse diet for the month of February. Even during months further removed from Valentine’s, reputable foodie sites and food blogs alike are constantly abuzz with various dessert ideas, totally disproportionate to all other content. I am not even going to talk about Pinterest. Doesn’t anyone eat normal savory dishes anymore 🙂 ? I personally believe that savory food is potentially so much more satisfying than the sweet stuff! Several years ago, umami was conclusively added as one of the five senses, or basic tastes, along with sweet, sour, salty, and bitter. Umami was deemed to be the dimension of deliciousness, or savoriness (and this concept virtually equates the two!). These days, I understand we are officially up to six senses, with the recent addition of kokumi (translated as heartiness, or mouthfulness; a sensation of higher intensity of flavor often brought about by curing, braising, or roasting). I may have mentioned before that I am fundamentally lazy, and that as a chef, I constantly cheat in order to maximize my cooking and eating pleasure. My goal is to find the least possible amount of work to have the best possible experience. Thus, I have learned to rely on umami-rich ingredients and methods producing the highest amount of umami in the shortest time possible (such as roasting). 1. Soba noodles in dashi broth, with fresh silken tofu, scallions, shiso leaf, and mountain yam (see above), served with good quality soy sauce (I love my Yamasa Yuki Marudaizu Ginsen soy sauce! ), and nori on the side. 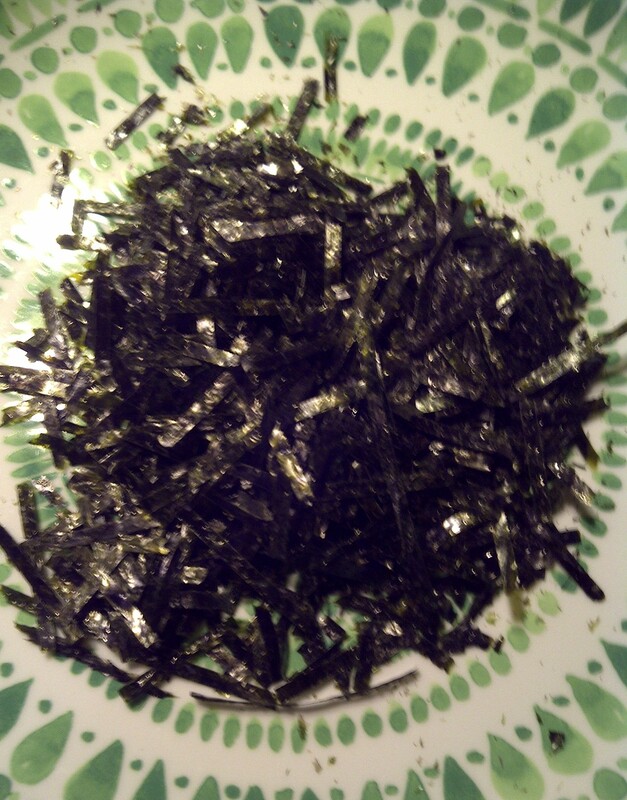 This dish features several umami-rich foods, – kelp and bonito flakes in the dashi broth, soy sauce, and nori. Soba noodles (which are made of buckwheat) are not only fantastic conduits of umami, but they add an umami dimension of their own due to their earthiness. I often supplement the dashi powder with miso paste or dry mix to moderate the fishy taste of bonito (the additional bonus is that miso is another one of those super-umami ingredients). 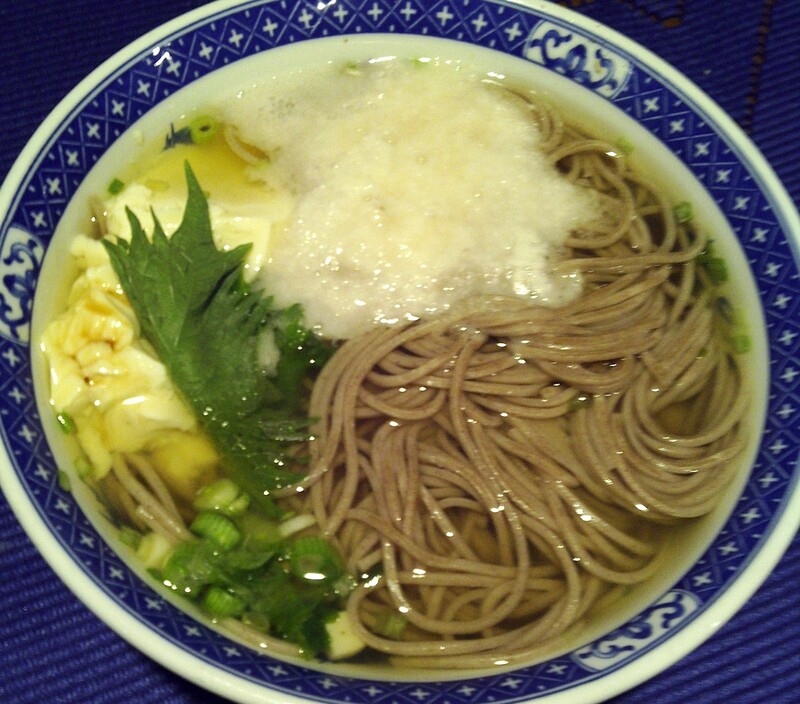 I also love this dish because of its textural interplay, so make sure you do not overcook the soba noodles. I typically shoot for a minute less than suggested on the package. The grated mountain yam and the fresh silken tofu provide a really nice contrast. Both of them are available in specialty Asian stores, such as the fantastic Japanese shop Hana here in DC. The mountain yam is really neat to work with; all you do is peel away the outside firm skin, and grate it (I like to use my Microplane on it). Its jelly-like, foamy texture is unlike anything else I have encountered. Shiso leaf adds another interesting note to the dish both in terms of aromatics, texture, and flavor. I am a big fan, and have previously written about shiso leaf here. For the soufflé recipe, I simply adapted the one I have used a number of times to make a blue cheese soufflé. I used a 24-month Parmigiano, but you can certainly use whatever aged cheese is available. 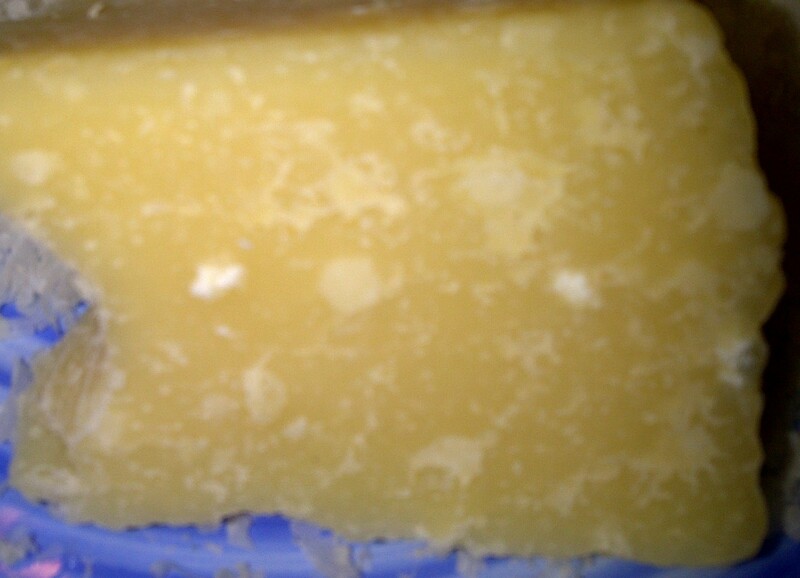 An aged sheep’s milk cheese will make it saltier and more intense. Most importantly, don’t stress about the soufflé too much; it does not have to be perfect. Go nuts: make it on a week night! (I did!) That’s right, soufflés are not just for snooty Russian service dinners anymore. It is true that my soufflés may not win any prizes for their beauty, but they are, as Italians would say, brutti ma buoni (ugli but good). This entry was posted in cooking, food, recipes and tagged aged parmesan, kokumi, ramekins, savory, soba noodles, souffle, umami by Come Due Maiali. Bookmark the permalink. I tried to limit the sugar damage over valentine’s day too, with some success. I think we’d like to try your souffle salad! Thanks for posting. Japanese style noodles are a big go-to for our household when we’re too busy or lazy to cook a meal. I can never find fresh shiso around here, though, which is disappointing. Yeah, here in DC we are fortunate to have a little family-owned Japanese grocery store which flows in Japanese produce from LA (plus sells stuff from local farms). This is excellent. Asian food is likely second only to Italian for me as a favorite and yet I cook and know how to cook very little of it compared to my Italian skills. Now, more than I ever we need to get together so I can eat all of this umami greatness. My grandparents were umami and kokumi badasses. My grandmothers braised roast with pan-jus gravy over fresh baked yeast rolls was from God for sure…great post Due Porchette! You see, the concept of “cooking” for me represents a sizable continuum, starting from opening a can of soup and warming it up to 20-step classic French recipes. 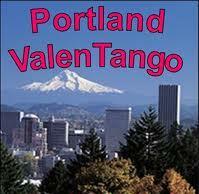 Enjoy your Tango in Portland. I am off to New Zealand tomorrow to search for whale poop (ambergris) on the beach and to do some real work of course. I’ll be living out of a hotel for the week but you have inspired me to share your blog with my partner who does all our cooking. When I get home I will use your blog to inspire some cooking…. This usually entails him being in charge of the kitchen and I am in charge of music and entertainment. Bon Appetit! Pleasure shared is pleasure doubled; I am glad you will be getting some tangible benefits from my blog. Have a fabulous trip! I have been making lots of sweets since I am trying to master pastry. But, point taken, I will focus on more savory dishes. 🙂 I will also bookmark the recipes you indicated. Love the broth Snd especially loving the souffle! Cheese, eggs and butter, heaven!!! Couldn’t agree more! So much sugar in February (and we have family birthdays besides). This soba dish looks wonderful. I have lots of sea veggies in the house so I’ll be bookmarking to try. Thanks! 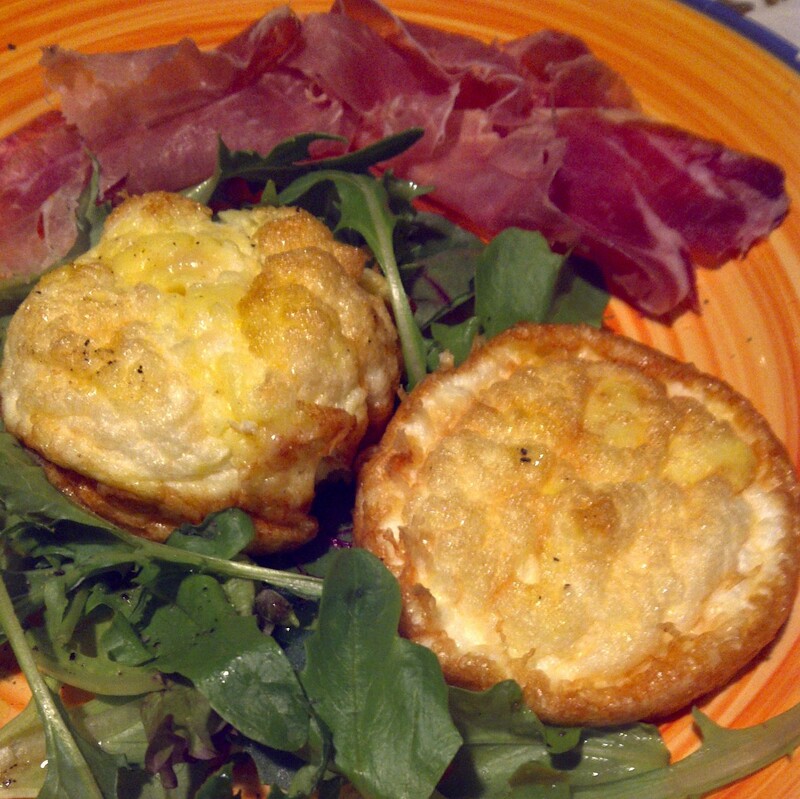 Pingback: Don’t Fret – Try a Galette | Come Due Maiali / "Like Two Pigs"
Got me with those souffles!